The goal of this research program is to optimize management practices for various micro-irrigation systems for almond, minimizing losses of water (leaching and evaporation), nitrogen (leaching and denitrification), and crop yields by water and salinity stress (drought). In addition, the HYDRUS model with associated root water and nutrient uptake models will be evaluated using extensive datasets acquired from an ongoing field project. The HYDRUS model is widely used for analysis of water, and nutrient movement in soils. We use the model to analyze field-collected data at Paramount Farms for the two studied micro-irrigation systems. To evaluate the results of the HYDRUS-2D model using extensive field data for specific treatments, and refine if needed. 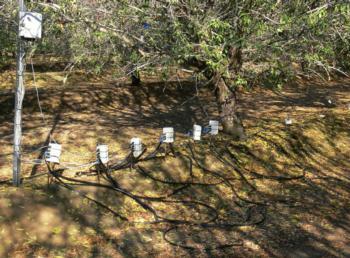 To determine optimal irrigation and fertigation practices for microirrigation (drip and micro-sprinkler) systems in an almond orchard using HYDRUS-2D, to improve water and nitrate use efficiencies and to reduce leaching and gaseous losses of nitrates, for a wide range of possible management scenarios (water, fertigation, salinity) and two fertilizer sources. We have deployed a variety of sensors to monitor the soil - water - plant - atmosphere continuum dynamics. Echo probes were installed within the root zone to monitor the temporal and spatial variation of soil water content, electrical conductivity and matric potential. Several tensiometers were installed below the root zone to quantify deep percolation losses below the root zone. Soil solution extractors will be installed in different locations within the root zone to quantify the spatial variation and temporal dynamics of soil nitrate concentration after each fertigation event. In addition, sap flux sensors will be installed into the tree trunk to measure the dynamics of tree transpiration. Figure 1. A schematic top view of the installed soil moisture sensors in (A) Drip and (B) Fanjet. The schematic in (C) shows the installation depths.